It was 5 years ago when I saw the opera at the Opernhause Zurich for the first time. The ticket was given to me by one of the Opernhause support members. Quite often, members of such group or Opernhouse fans give away their tickets/seats to some acquaintances, for example, when they cannot make the performances due to travels, etc. Right behind the orchestra pit. Center in the first row. He had sort of supernatural appearance with dignity that I had never seen before. The big body slowly walked to the conductor’s podium from the wing of the stage. When he stood up there and turned around, a big roar of “Maestro! !” was heard and the sound of clapping hands echoed in the whole opera house. Santi’s face was right in front of me. Born in 1931 in Italy, 78 years old. No adjectives such as old and mature will fit at all to describe him. He is one of the best contemporary conductors in the world, capable of creating strong, sensitive and lyrical music. While he performed in Opernhause Zurich as a conductor in 1958 for the first time, even with the change of music directions as the time went by, Santi has been and still is the proud existence of this opera house. He regularly performs with NHK Symphony Orchestra in Japan. The music Santi created and the ultimate aura he brought about became a magic to me, and I was unspeakably shocked that night. This maestro Santi conducted “Il barbiere di Siviglia” by Gioachino Rossini, which was one of the most outstanding and talked-about operas this year at the Opernhause Zurich. With the bold idea by Mr. Pereira, General Manager, for the “Il barbiere di Siviglia” this time, Italian star architest, Mario Botta from Ticino of Italian-speaking part of Switzerland, was in charge of the scenic art. The producer was shrewd Cesare Lievi. While it was a unique collaboration, it was a great production of performers with big name veteran singers as well as young able ones. It was early 19th century in Siviglia, Spain. The neighborhood factotum, barber Figaro succeeds in making the love bear fruit between the young beauty, confined in the house of the guardian doctor, and the count. Figaro somehow manages to come through by various witty ideas against conspiracies or sadistic and persistent interferences by the guardian, and the couple ends up being happily married finally. This is an opera buffa and well known as an ironic comedy. 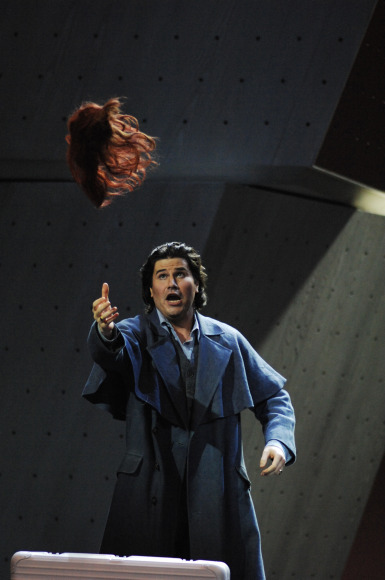 Massimo Cavalletti, as Figaro showed a thorough bright star quality. 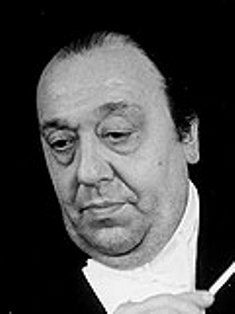 Doctor Bartolo who plotted a marriage after the money of Rosina who was a bird in a cage, was played by Carlos Chausson. Basilio, a music teach who courted him, was performed by Ruggero Raimondi who played a villain with real fierce expression. The singing and performances by these two great veterans sparked like oxidized silver and brought about certain dignity to this high-quality comedy by Rossini. 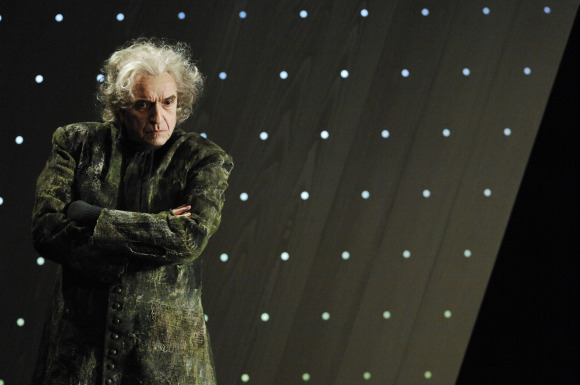 Count Almaviva, who tried to confirm the love of Rosina by lying about his identity, was played by Mario Zeffiri. He appeared in front of Rosina in ever-changing disguise, sometimes as a soliver, or a music teacher in other times and so on. 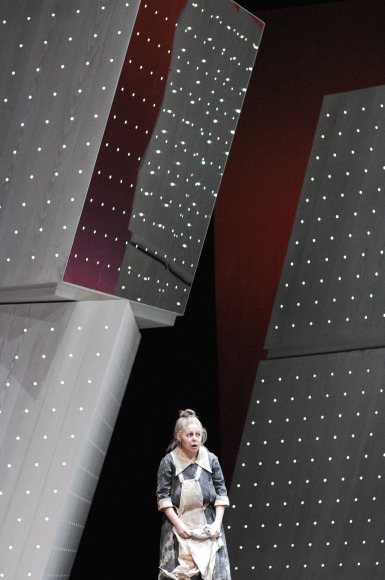 Lady Rosina was played by Serena Malfi of mezzo-soprano, who made her debut in this stage for the Opernhause Zurich. She was cute and smart contemporary young woman. She even went a head of the wisdom of Figaro trying to lead their love into fruition by fighting against the spite of the guardian. A bit whimsical but honest. She loved the Count Almaviva who was in disguise as a poor student. I heard that he consulted with the designer so that the costumes would be largely separated into 2 parts; for very old people and for the young. Although this comedy was based on the conflict between generations and concepts of values, as well as those between aristocrats and commoners, it also tried to express the conflict by way of costumes. Although it is assumed that the barber Figaro could have had lots of chances to achieve a successful career in that age judging from his sharp mind, his character showed that he was indifferent to such a matter. While he domonstrated light and easy performance and made us enjoy his singing with his active role, he had the coolest vision among all the characters. Favorable impressions of popular familiarity and artfulness owed a lot to the character of Cavalletti. Also Rebeca Olvera, who played the role of the servant Berta who was always sneezing, enchanted us with her beautiful soprano aria. Even though she belonged to the “old people” with her old servant role, her skillful acting of easygoing stupid personality played a role of sophisticated spice in the whole story. 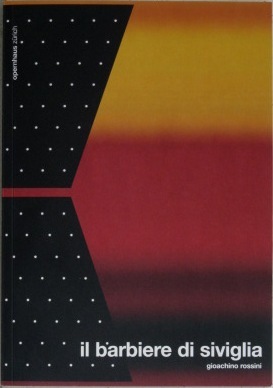 Well, the stage design by Mario Botta brought pros and cons for the audience as well as the media. I thought it was an audacious challenge and interesting, typically this opera house, however, the newspaper criticized quite harshly. 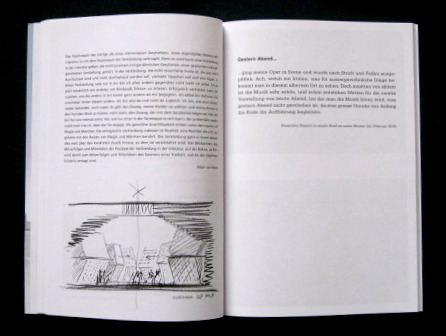 Botta says that the city of Zurich itself is an interesting target. Although he has designed the ballet stage of this opera house twice, it was his first time for an opera. Four metal-grey double cubic moved around the stage as the story went on, by changing lights or showing movies or mirrors on the screen. Also the trunk that the factotum barber Figaro carried was his shop itself that opened up anywhere. Scissors, wigs, the limb, or even a giraffe with somehow ever-extending neck appeared as well. The number 15 was written large, and it was assumed that the address wherever he opened up his shop was 15. Let’s go back to the story of Botta. Curtain calls continued and Nello Santi also came up to the stage. I heard that he could play any musical instruments of the orchestra, and he played whispering cembalo this time. “Rossini Crescendo” that Santi expressed turned out to be a poetic and elegant work where music expressed laughter, humor and irony, just like Rossini tailored this comedy of high quality. The maestro bowed his head deeper than anybody else, and then slowly looked around the audience with a gentle smile. A little while ago, when I was waiting for the tram, I felt some bizarre human figures behind my back. In this city of Zurich, as you may encounter certain things or people far from the practical world, I thought it would be this sort of thing, and got on the tram without turning around. My way back home. Now I saw those people from the window of my tram. They seemed to have sore throats. 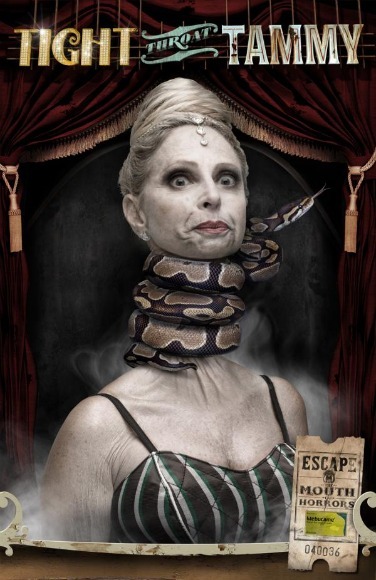 Tammy’s throat is tighten up by the snake and she lost her voice. 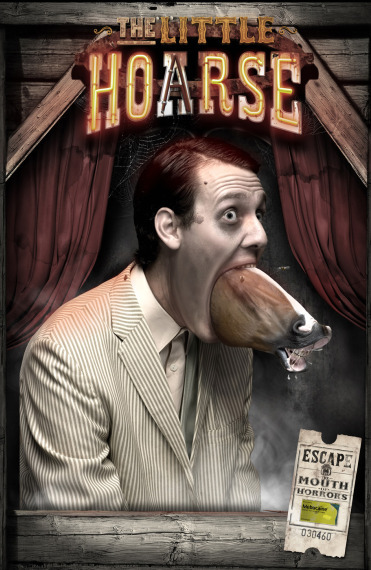 Her friend talks in “hoarse voice” because “the little horse” is kicking inside his throat. 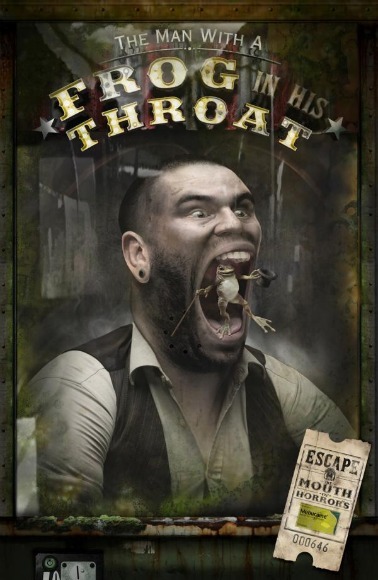 Another friend has got a “frog in his throat” which makes his throat sore after all. To fight against these wild beasts that bring such horrors, ordinary throat candies will not work. “MEBUCAINE SORE THROAT REMEDY” is here to bring you peace to your throat. Well, to demonstrate how powerful these drops are, let’s appeal its high efficacy with sharp visual impacts. The mode of expression is surreal anyway. Love to see those people who have made such a decision. This is a series of advertisement of Novartis, an international enterprise with its headquarters in Basel, Switzerland, who is also a topnotch leader in the pharmaceutical and biotechnology industry. When a friend of mine from Japan visited here, I took her to one snobbish restaurant that the locals were talking about. Although I was sure it was a well-thought-out arrangement, she did not seem to be content at all unfortunately. As a matter of fact, it has been a trend for some time in European and North American restaurants in every city to serve fusion type of food, incorporating Asian or Japanese materials or tastes. Of course we can enjoy sophisticated surprises occasionally, however, quite often, they are not well incorporated or all look and taste more or less the same unless the original cooking ability is superb. So the day after, we drove as far as some grassland where you could see cows, took some commemorative pictures with them, and went to the restaurant that was a remodeled cow-house to order fondue and homemade sausages. I heard that she bought a fondue set at the airport, and I was able to send her back home happily. Fondue is a good way of entertaining when friends get together, since you do not have to spend too much time in your kitchen. In other words, it is a Swiss version of Japanese “Nabe” cuisine. I am a bit embossed to say this since I am not a Swiss, but anybody can cook this easily. There are surprisingly many variations, and the combination of cheese or selection of liquors make your own house taste, which is quite interesting. While homemade fondue is enjoyable, it is also fun for the season to have tasty fondue in a good restaurant. 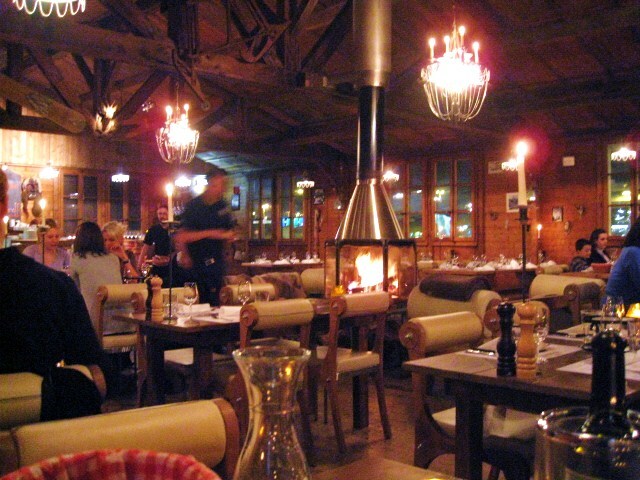 While there are several fondue restaurants in the city, many “specialized” ones are open only during the fall and winter seasons. Of course if it is somewhat for tourists, or have general Swiss cuisine in the menu, fondue is often included, but that can be rather exceptional. The strictly “specialized” restaurants will be closed when the season is over. Not to mention closing the restaurant, some fondue restaurants disappear without any trace. On the other hand, some appeared out of nowhere several years ago, and have become smash hits. They have restaurants in Basel and Zurich, and the mountain lodge restaurant in the airport premises in Zurich is open from the end of November till the end of March. If you want to secure seats on weekends, you may have to make a reservation many weeks in advance. 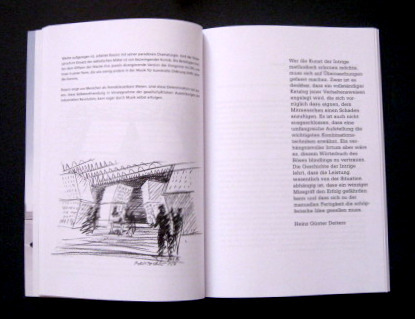 The interior is done by Heinz Julen, artist from Zermat. Having a “dream room” appearing in the city as the concept, everything time-slips to the heart-warming 1950s once you step inside. Firewood logs are piled up around the mountain lodge and covered with snow. 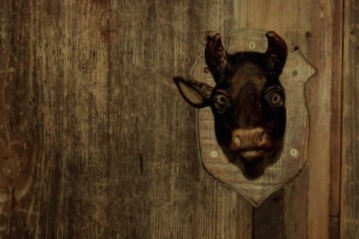 Once you open the door with a cow’s head, you will see the rows of antique stake plates. Inside the room, logs are burning red in the big fireplace. On the wall you see a stuffed alpine ibex, a wild goat, and antlers of antelope, and old monochrome picture of Zermat. What we ordered that night was called Motie-Motie, which was a typical Swiss fondue combining Vacherin cheese and rich Gruyeres cheese, half and half. As tomato fondue and champagne and truffle fondue were well known in Switzerland, we tried their original named Baracca Fondue with fruits and bacon. For the wine, we picked up Johannisberg from Valais Province where Zermat is located. While this white wine was fruity and rich, it was smooth and went very well with cheese. It had the label of Matterhorn, and sat there as a table wine. The reason why Kirsch, which is cherry spirits, is used for fondue quite often is to help digestion. Therefore, instead of white wine, having fondue and drink Kirsch is another royal road. Although it is said to be good to your body, the alcohol content is over 40 degrees. So you’d better watch out. Fondue is a very rustic cuisine, which is served in a pot that is used many times for a long time. Coldly simple tablewares and plastic wine coolers. The trick is when these simple factors are integrated and brought into a city, they look rather luxurious and sophisticated. I must say that it is well designed so that you can have relaxed moments somehow by enjoying slow food, surrounding a big fire, in a mountain lodge literally like a barrack. Poking a piece of bread in a skewer and turning it inside the pot, I was thinking this would be the last fondue of the season. Unusually cold with heavy snow, this long winter is going away. This dream restaurant will be dismantled in a few weeks, and will disappear somewhere together with many stories that warmed up the people. Spring is jus around the corner even in the Northern Europe.